I’d argue that anise is probably the most polarizing of all flavors…either you love it or you despise anything that tastes remotely like it, read: fennel, black licorice… The surprising addition of star anise to this simple carrot soup however, lends such a soft lovely flavor I’d urge even the most die hard anise-haters to give it a try. Give the onions and garlic a rough chop (all will be pureed so it doesn’t have to be pretty.) Melt butter and oil over medium heat in a large pot. Add onions and cook until soft. 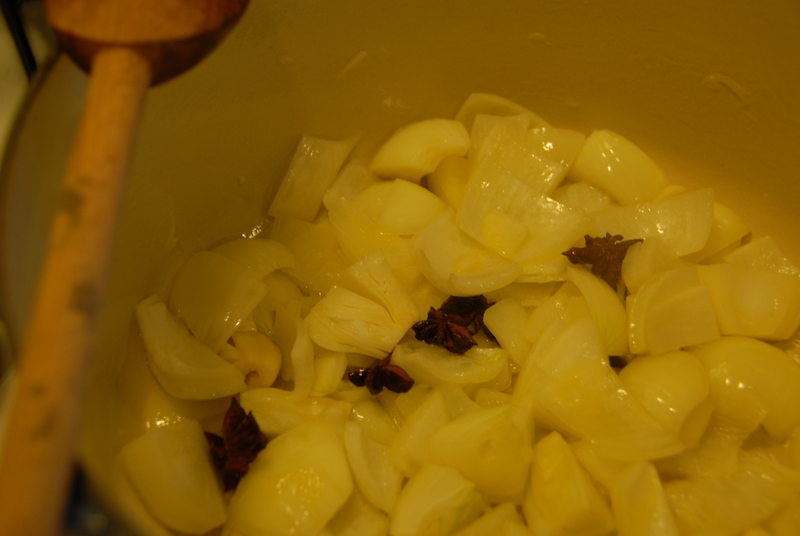 Add aromatics (garlic, star anise, thyme, bay leaves) and cook another 5 minutes or so. 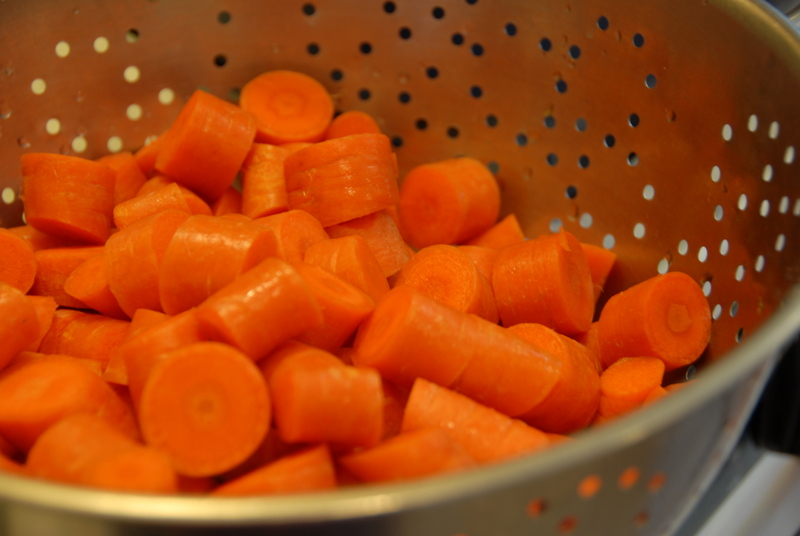 Full disclosure, I did not peel these carrots, only gave them a good scrub. After scrubbing (or peeling, for traditionalists) place in pot and cover with stock. Bring to a boil and then reduce to a simmer. Simmer for about 30 minutes or so until the carrots are very tender. Remove the bay leaves, star anise and thyme. Blend using a food processor, blender or immersion blender. When making a pureed soup it’s best to start with just the solid mass (veggies), puree well and then stream in liquid until it reaches a consistency you’re happy with. Taste and season to your liking with salt and pepper. Cut bread in small, like sized cubes. Heat 3-4 T butter in non-stick pan until it starts bubbling. Place cubes of bread in the hot pan, toss them around until browned equally on all sides. Once browned to your liking cool on a paper towel and sprinkle with salt. You’d think with what a simple recipe this was I would have gotten it to you earlier in the week…sorry for the delay folks, but at least you have it in time for Sunday supper! 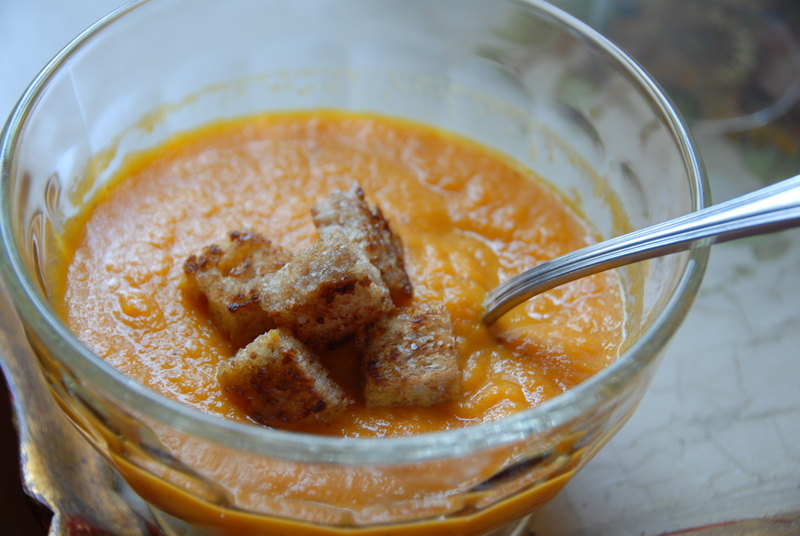 This entry was posted in Carrots and tagged carrots, croutons, simple, soup, star anise. Bookmark the permalink.